While I was getting the Tau Skyrays I thought I’d pick up some of the Tau light recon vehicles too as they look really cool. 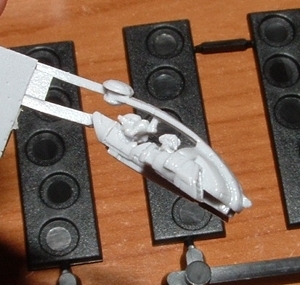 Unlike the Skyrays, each vehicle comes as a single piece, which is a pretty good piece of casting. 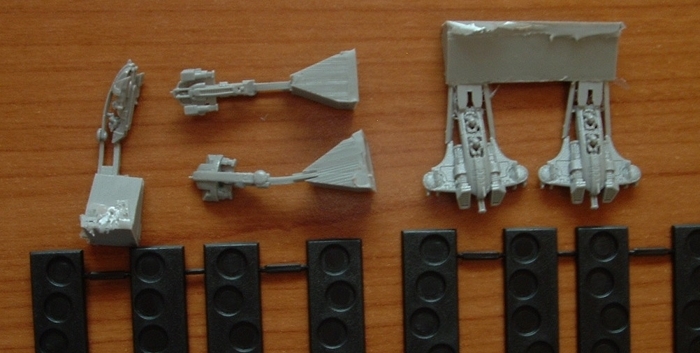 As you can see, you also get a couple of sprues of the current Epic bases, and a set of chunky casting blocks to remove. Casting, while I’m on it, is again very nicely done with minimal flash lines and other gubbins to be removed (once the casting blocks are taken off). I’ve balanced the Tetras different ways up so you can see some of the detail. What’s particularly nice is that you can see through the Tetra from the side, as in the picture at the top. It’s a really fine piece of casting, and a great thing to do. It’s just the sort of thing that companies often compromise on and fill in to make the casting easier, and I’m very happy they haven’t taken that route here as it helps to emphasize the delicacy of this light craft. 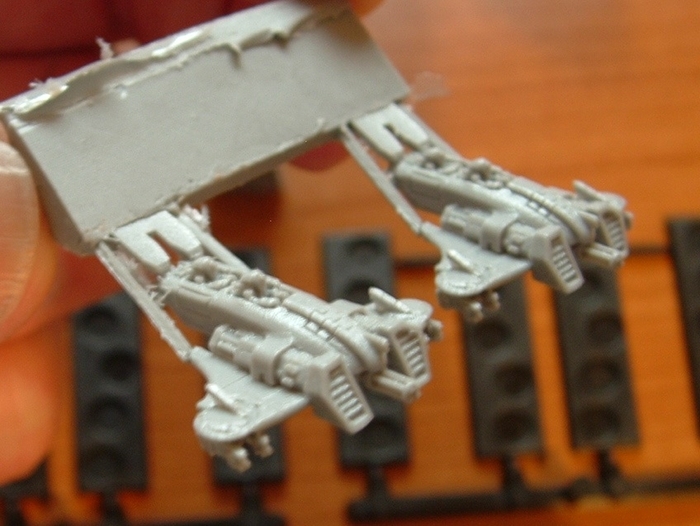 One of the things I like about the Tau is the clean lines of their vehicle designs, and this has been captured perfectly in these tiny models. These sleek little craft are only about 18mm long. The Piranha is the bigger brother of the Tetra, and again the casting captures the lines very well. The exposed crew are visible in both vehicles as you can hopefully see here. About the only thing that’s wrong with these is that I don’t think they match the unit sizes for Epic, so I may end up with odds and ends of models. Still, that’s hardly a big issue. Overall I think these are great models. I just wish Forge World still made the rest of the Tau army.